Swiss taxpayers pay more in cash than UK taxpayers for rail "subsidies" (not quite the right word, as it'll include investment in every case). France was over triple the UK's cash level, Germany over 4 times. That's likely been replicated across many years too. That's where the difference is. We collective are the ones who don't want to pay more tax, so collectively we get what we deserve really. would you look at that, Tubby Isaacs? posted essentially the same thought! I also get the impression that there is still a stigma in the UK in using public transport, especially buses......buses that are even more a scandal than trains to be honest. On the continent that seems to be less evident. None of the interesting transport issues are about nationalisation as Labour seems to think. Rail is already largely nationalised. The profit margins of the franchises are tiny. The issues are difficult and require evidence, judgement and thought. But I don't think most people are interested in that. They're more comfortable thinking nationalisation is the "left" solution, and so plumping for that. Lazy. I agree with this, it is comfortable thinking, based on a misconception of why train tickets are generally expensive. Nationalisation is also (wrongly) thought to be cost free, when you'd have to buy the rolling stock companies. The biggest advantage I see to the privatization of train companies is that they can be much more aggressive in raising business and peak time and first class fares, bringing much more investment to the railway than would otherwise be the case. There's no reason that a state railway couldn't be priced like this, if so desired. National investment in a comprehensive, integrated, reliable, frequent, easy-to-use and safe national public transportation infrastructure project helps protect our degraded environment due to inefficient motor vehicle usage. Less pollution, people healthier, less stress, public thoroughfares open up to children and other people. Rural areas served by a functional system just like any other area of the UK makes that area competitive for businesses, tourism rises, genuinely greater mobility for all, for everyone. Free at point of use. Lots of high-quality jobs keeping the national public transportation system operational. Automotive industry ain't going to dig it. In strictly monetary terms, the amount of revenue government and businesses make out of selling everyone at least one car might be more than the revenue generated from...not. I'd love more taxpayer money on rail. And as you say, investment all across the board has been too low, though with some improvements by the Labour government in later years. I'm just saying how the system works now. Since 2007, ticket prices have been allowed to rise by above inflation so that the taxpayer money goes less to making fares cheaper and more on investment. It's "worked" in that it's achieved what it was intended to do. But there's a very obvious downside to it- rail is expensive. I think buses have a stigma. I don't really like trams very much because the wires look appalling (that might change if battery powered trams can be made to work). But I think they do attract passengers who won't get a bus, so that's very positive. Train fares are too confusing, for tourists, and many others. I managed to save a friend £20 on his ticket to see me by splitting his journey into two fares. Ridiculous really, though apparently it happened a bit under BR, and they wouldn't have appreciated you taking up time at a window trying out lots of combinations. I think the National Rail site ought to have a bit of fare splitting software on it, for advice. None of them seem to work every time, but it might help, and people would understand the principle better. I've just seen more from Laura Pidcock. Not going to be friendly with any Tory MPs. Lucky we're trying to build a cross party alliance on an important issue or anything. She's been there 5 minutes and already done interviews with Sqwawkbox and Russia Today. "I'm here for my class". And, er, your constituents of all kinds. Why should she be matey with Tory MPs if she doesn't want to be? The widespread sense that politics is a chummy "game" is one thing driving stuff like Brexit and Trump. She also made clear she will represent all her constituents regardless of how they voted or anything else. Not that several media accounts bothered to mention that. She does raise an interesting point though. Could you be friends with a Tory? I could, and am. I'm friends with people of dramatically different political views from me. I also doubt many Tories have any problem at all being friends with Labour supporters. But some on the left are good at hating. They *hate* Tories. I am sure someone like John McDonnell has no Tory friends for example. For them it is personal. Some of our more vitriolic Tory haters have left for more comfortable pastures in order not to read anything that they might not strongly agree with, but I wonder what others think. Is it reasonable to take politics to this personal level? Or is it a sign of a closed mind? I don't see the need to understand how splitting works....I saved myself £75 not so long ago by the way......it should just automatically tell you the cheapest fare without the complications. I was glancing at Sqwawkbox directly. I gathered it must be what was being referred to on here before. I'm sure there are plenty of Tory MPs you can learn from. Loads of them will have done very effective casework, been school governors, local councillors etc. If you think too much in terms of "the enemy", you're going to miss out on that. She's adjacent to two Tory constituencies. It wouldn't hurt to have amicable relations with their MPs. Going to apologise for calling Corbyn a liar? And in the end, is there that much difference between most people despite who they vote for.....many people I know are actually pretty apolitical and just knowing who someone voted for does't tell the whole story. I know some great people who vote Tory as they know their local MP and don't want to pay any more tax than they do now.....I disagree with them on that last point but is it enough not to be friends with them? Last edited by howsillyofme1 on Thu 24 Aug, 2017 4:48 pm, edited 1 time in total. It depends on your perspective,as previously stated we are lucky in that we have a very good local bus service,well used,regularly,all accessible and cheap.I have never understood the looking down on thing,though I never did over housing,given we had a Scandanavian Barrett built,downstairs loo etc as Council and took as much pride over my £10 a week one bedroomed HA flat as I do now,it's my home.A form of transport is a form of transport though I have never driven,still have managed to get to a fair few places and enjoy being taken,no longer being able to smoke on board notwithstanding and talking to people rather than pretending I am a grand prix driver and all other drivers are my competition and the you get get a double decker bus through there and sounding horn on a nanosecond delay in responding to a changed light etc.Coaches are o.k.but when we wanted to travel any distance,they were still in the process of being made accessible,trains were far more convenient for various reasons,in effect,the only reasonable way to get any distance,certainly where we wanted to go. Splitting, as far as I can tell, works when the train operator is offering a discount between the start/end of your journey and somewhere that you pass through on the way. In my friend's case, he was going home from seeing me, travelling from deepest Herefordshire to London. For some reason, the train operator wants to offer a really cheap (£6) fare from Worcester to London. He's bought that ticket, and an extra single from deepest Herefordshire to Worcester. That works out at £11.70. There were no promotions offered for his whole journey, and he'd therefore have had to pay the full off peak fare (something like £33, IIRC). Apparently, this did happen with BR to some extent too. The promotional fare is nice to get, but it's hardly fair on the person who takes the same journey, books at the same time, and goes on the same trains but pays £20 extra. Promotional fares probably do though have a positive role in getting people to use trains who might not otherwise. I don't know, maybe they've identified Worcester as a place that doesn't have as many people using the train to London as might be expected. My friend is certainly more interested than he was, so I wouldn't want to stop this kind of pricing. I'd just like to see some software, where everyone could see it, that could help you find these splits. Tarquin is far too radical for me,but understandable when you have been denied even a vote. In the '90's it was cheaper to buy my ticket from Three Bridges to the midlands,than a ticket bought just from London by some degree. Last edited by HindleA on Thu 24 Aug, 2017 5:08 pm, edited 1 time in total. I don't know about McDonnell, but Tony Benn used to have Tory friends. I read his diaries (which are excellent) and actually used to find it a bit irritating, the sense that the Labour Left and the Tory Right on Europe were great principled people. I think McDonnell used to get on with Zac Goldsmith before the awful mayoral campaign, because of Heathrow. SH give it a rest,no one hates the Tories more than me,not least for proven and continued systematic and grave violations and regression from what took hard fought for decades of effort to build up. Corbyn's good relationship with David Davis in their mutual backbench days has been commented on. But the point is - as with the friendships based on fellow Euroscepticism mentioned just above by Tubby - they had common interests regarding various what might be loosely described as "civil liberties" issues. Some "centrists" just seem to think Labour and Tory MPs should be mates automatically, and are genuinely annoyed at Pidcock for not agreeing. Not forgetting,of course,the Wail money advisor S Webb et al for the crucial part they played. Tory MPs have made a commitment to a political party I can't respect or support. They're each a person. I'd strongly encourage them to think better of their association, work for everyone and not a few. That would likely mean leaving the Tory party. A person isn't wholly defined by their memberships but some clubs are worse than others. I hold Tory MPs responsible for the needless harm they've inflicted on people and country since being in government. I didn't care much for the Tory party prior 2010. I'd no idea how bad they could get. Ah, Civil Liberties, that's a good point. You have right libertarians and left libertarians, who can do usefully work together. I think that's an area where there was principle, rather than the ignorance there was over Europe. Yeah, I think the way some somebody who know about rail splitting can get a better price than somebody who doesn't, that does fail basic customer service fairness. Once at Gatwick Airport (I didn't feel confident enough to book a particular train in advance, dependent on a flight arriving on time), the train company employee at the desk brought up some scary sounding fare, and looked puzzled. He went away, spoke to somebody, and came back with a much lower amount based on splitting the journey at Reading. But that's hardly systematic. I could have gone to another window and paid far more. The funny thing about this is that the "extra" revenue that train companies get from this is factored into what they bid for the franchise. So arguably, I as a taxpayer, represented by the DfT, would be ripping myself the passenger off. 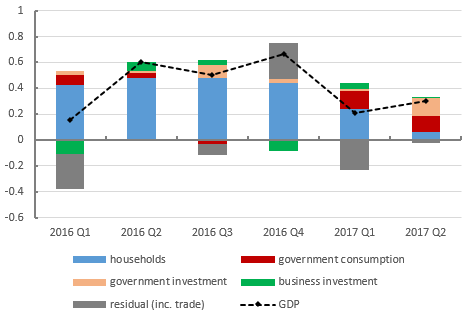 Those Brexit small staters will doubtless be up in arms about that increasing government consumption. Some years back I moved to the Co-op for gas and electric because they were offering a single variable tariff for all their customers, so no one was getting a "discount" at the expense of others on an expensive "standard" tariff. It was an ethical rather than economic choice, but I didn't find them especially costly at the time. Then along comes Cameron who "reforms" the energy market and suddenly not only can I no longer earn dividend points but the Co-op's single tariff suddenly turns into multiple tariffs and I'm back to fixed rate "discount" deals that always seem suspiciously more expensive. Having only really moved for the single tariff I'm now back to the yearly "shop around". We all use exactly the same energy via the exact same infrastructure but in order to buy it we have to trail around getting "quotes" like you would for something unique and personal like home or car insurance. As with rail tickets, you can't just get a list of prices to compare, you have to get a "quote" and have no idea what your neighbour is being quoted for the exact same thing. No way of knowing if you have a good deal but the assurance that if you are someone else is paying well over the odds to pay for it. Yeah, that's pretty unfair. At least with rail, and the example with the split fare earlier, there was probably some rationale for there being very cheap fares offered for part of the journey, in terms of attracting new people to rail. Energy isn't like that at all- it's not like anybody says "I didn't realize how cheap electricity was, I'm going to use it from now on!" I hadn't realized that a public train company could bid for Scotrail next time. That'll be interesting. The SNP might be wishing they were still able to moan about Westminster not allowing it. They might or might not make improvements, but they'll be under pressure to restrict (unregulated) fare rises more than private operators have. It could very easily end up with tickets being cheaper and investment being cut. What might have been better is something else they've been campaigning for, but not got- that's a Scottish Network Rail. They've been let down by the UK version, with delays and overspending. How likely am I to say, "Blimey! That 'frig' is using a lot of electricity. I think I'll switch it off"? than they took out in tax credits and Child Benefit. This is £1.4bn higher than in 2013-14." Do we have his opinion on this here data? I panicked when I put the kettle on,after berating fridge,freezer etc for giving a reading above 2 whateveryoucallits.I have put the thing in the back of a cupboard somewhere. I must give all proceedings to myself"
#CRPD17 rapporteur describes dialogue with the UK the most challenging exercise in history of the disability cttee. Last edited by HindleA on Thu 24 Aug, 2017 7:50 pm, edited 2 times in total. I call nonsense on that. Nobody subscribes to this "automatic friends" view. where does all the bloody money go? I think the data is probably OK, and better than the cash figures I put up. We aren't big spenders, and those figures probably take the whole public amount spent on rail as "subsidy". If you take the bit that directly subsidizes ticket prices, then we'd have an even smaller number, I expect. I can see why Miliband was cautious about tax rises, and they took a decision to spend all or virtually all on the NHS. It might have been better to take some of that money and earmark it for things like rail, or legal aid. If you vote Labour, X will get sorted out, and you'll see it. Then again, I'm not a great predictor. why does a certain poster continually pick up on clearly throwaway comments by other contributors and try to create a row over nothing rather than dealing with some of the challenges to the nonsense that he himself posts? I thought the Kettle link-link was deliberate, too! Thanks, and my apologies to you. Been good discussion. If you read this article and the sub-heading - would this have been the headline you would have used? I think the story is probably interesting but not for what the headline says! Last edited by howsillyofme1 on Thu 24 Aug, 2017 8:29 pm, edited 1 time in total. I hate waste,both in personal and more general terms,so it isn't just about amount but effectiveness,purpose and in my areas of interest what I call.cost saving investment purposefully because,again purposefully,it is labelled a "problem/subject to lifestyle choice exhortions or whatever,basically bad or more correctly transmuteable dependent on propaganda purpose.The spewing of monies-£31-£52 g per assessor,or more correctly a computer operative far better deployed in the care field they are trained for and the eye watering amounts associated with paper only PIP assessments alone,perhaps gives a hint as to where the money is going. Yes, the numbers have been rising spectacularly. I don't know if it was widely foreseen, and even with better funding, it would still be very hard to keep up. If rail became pleasant, as it often isn't, God knows how many might use it.